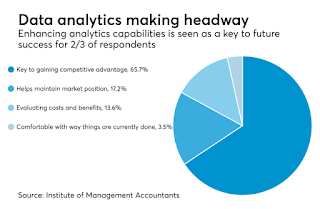 Contrary to the hype surrounding data analytics, relatively few organizations have fully embraced the technology, according to a report by the Institute of Management Accountants (IMA), though accountants can play a role in helping companies implement such programs. 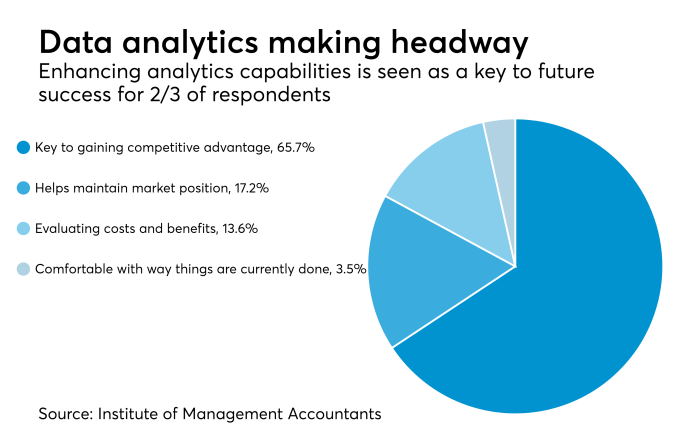 According to the report, only 8.5% of the organizations surveyed by the Institute of Management Accountants a year ago have completely implemented their desired leading-edge analytic techniques and technologies. Out of 170 organizations polled, 57.5% are in the process of working on it while 23.4% are only just starting. Many organizations strongly believe improving their analytical capabilities are key to their future success, either by helping gain a competitive advantage over their rivals (65.7%) or helping maintain their current position in the market (17.2%). Still others were unsure, with 13.6% of the respondents indicating they’re still evaluating the costs and potential benefits, and others expressing more reluctance, with 3.5% of the respondents saying they’re comfortable with the way they are currently doing things. "big data" and analytics on the relationship between accounting and finance and the rest of the organization has been relatively positive. In those organizations, finance is now perceived as more of a business partner or business leader than as a threat. “The ability to make timely decisions to stay ahead of their competition in developing and executing a strategy is what differentiates high-performing companies from others” said IMA vice president of research and policy Raef Lawson, who is also the co-author of the report. Organizations that are midsized struggled the most when embracing big data and analytics, citing difficulty in strategic decision-making. Strategy formulation was the area seen as most affected by greater use of analytics. Only 7% of companies overall in the survey indicated they are extremely agile at making strategic decisions, while 46% said they are OK at making such decisions.